We're 64 days out from the 2019 Canada Winter Games in Red Deer. 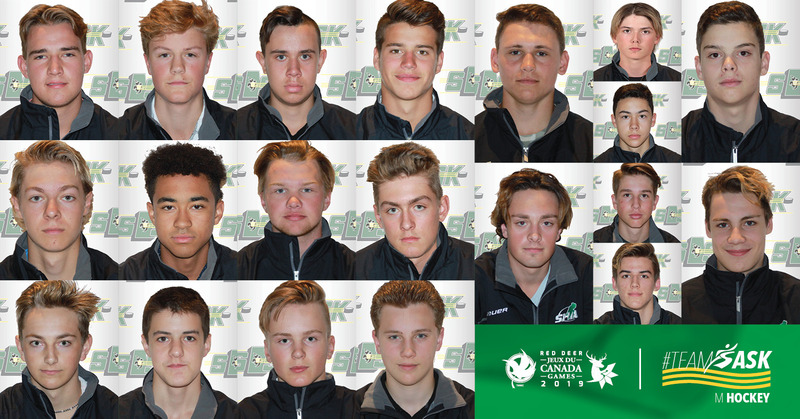 With 13 Western Hockey League teams represented among this talented roster, we're welcoming the Team Sask Men's U16 Hockey team! The player roster will feature an entirely new squad from the 2017 Team Saskatchewan that participated at the Western Hockey League (WHL) CUP in Calgary. This year’s team feature three (3) first round draft picks of the 2018 WHL Draft. Those players are Nolan Allan (Davidson) picked third overall by the Prince Albert Raiders, Cole Sillinger (Regina) picked eleventh overall by the Medicine Hat Tigers and Gabriel Klassen chosen nineteenth overall by the Portland Winterhawks. Team staff for the Male Under-16 team is Joel Houseman (Director of Operations), Gordon Burnett (Head Coach), Devan Praught (Assistant Coach), Rod Dallman (Assistant Coach), Chris Beaudry (Video Coach), Bill Gibson (Head Scout), Kacey Moffat (Athletic Therapist) and Josh Houseman (Equipment Manager). Men’s Ice Hockey was first introduced to the Canada Winter Games in 1967, it was in 1979 that Team Saskatchewan first participated on the boy’s side. The best result achieved by a Male Hockey team was gold in 1995. It was Patrick Marleau (Aneroid, SK) who scored the golden goal against the hosts, Team Alberta. Most recently, Saskatchewan’s Male Hockey program is coming off a 7th place finish at the 2015 Canada Winter Games. Male Hockey will take place from February 16 - 22 at three Red Deer venues: Centrium, Downtown Arena, and Kinex Arena. Team Sask will open the preliminaries in Pool B against the hosts, Team Alberta. Tickets can be purchased here.